A list of references with contact information is available upon request. Please don’t hesitate to contact us. We have serviced over 1800 property loss claims, and have a very long list of satisfied clients. Words cannot express how much gratitude and appreciation I have for you and your staff. The length in which you all went to lift my burden and ease my stress was remarkable — you treated me like family! Cheers and best wishes to you all! As a Real Estate Broker and Licensed Builder, Michigan Fire Claims has helped me and many of my clients over the years. Their empathy to the insured’s situation carries through during the entire process. They take the time and care to ensure they clearly explain every step of the process, in what in most cases, is the most catastrophic situations most people face in their lives. In every case, they have helped me maximize insurance claims in some circumstance 2-3 times what the insurance companies initialed offered as a settlement. Let the professionals deal with the insurance companies, this is what they do and they do it very well. Even more impressive than their advocacy on our behalf was how well we were treated by everyone we had contact with. To MFC we were a family that lost everything. Everybody was humane and kind. We felt as if it was always much more than business with them. We are eternally grateful for Tom, our adjuster, Gary, and all of the rest at MFC. Thank you for treating us as friends. We will be forever thankful that you were around to help our family our family at our greatest time of need. I would recommend your company to anybody who could use your services without hesitation. Jerry and I wanted to thank all of you again for the assistance you gave us between the fire and our getting into our new home. 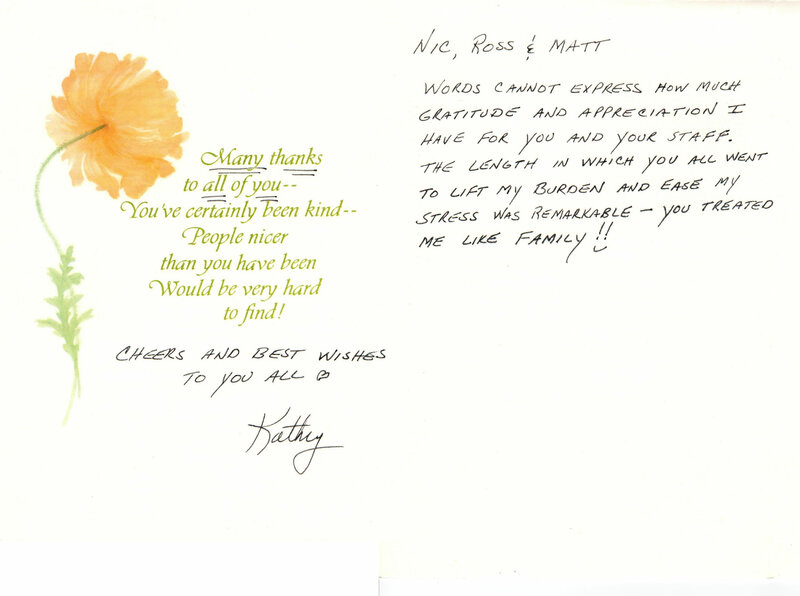 Matt, you and Ross gave us reassurance and guidance working our way through this process. Kay, thanks to you for your extra time here trying to make sense of the cleaning inventory concerning what they did and did not do. We realize that you, Matt, made numerous visits to calm me down and give us support when we were overwhelmed with everything going on. We are very grateful. The job everyone did and the function and support of your company was priceless to us! Michigan Fire Claims saved my life. On June 7, 2014 during the time while I was undergoing cardiac rehab, my home was totally destroyed by fire. It was a very traumatic experience with my son being taken to the emergency and losing our beloved pet, Hugo, a 200lb Newfoundland in the fire. The day after the fire a very good friend and house builder came over with his dad to give his condolences and at the same time told me that he could not rebuild my house for the amount on my insurance policy. At a meeting with my insurance adjuster I was led me to believe I only had $200K insurance to rebuild, I was devastated. A week later I received a letter from Matt Slotka, MFC vice president, a sales pitch about how they could help me rebuild my home. I ignored the letter thinking it was just another company wanting to make money over my tragedy. During this time, we were living in a 33 foot camper home on the premises and everyday we could see the burned out ruins of our home while grieving for the loss of our beloved pet, Hugo. Another letter from MFC arrived in the mail a week later and this time Matt was very personal and advised me that if I did not consider his company, to at least hire a lawyer. The advice given made me realize this company was genuinely concerned for me. I immediately called his cell number and left a voice mail, this was on Saturday. On Monday, Matt drove up from lower Michigan and as he sat in our trailer looking at my insurance policy, he said I had nothing to worry about, I had “Guaranteed Replacement Value” on my home. Which meant the insurance company had to rebuild my house as it stood before the fire, regardless of the cost. Had I not contacted MFC, I would have dealt with Auto Owner’s agent and built a much smaller home than what I had before the fire. Moreover, I would not have recouped the all the money needed to replace our contents. Thanks to MFC, I was able to rebuild my new home at today’s prices, double of what I was told at my meeting with the adjuster. My wife and I are very grateful for Matt and all of MFC staff to help us get our home back. We are very comfortable in our new home and wholeheartedly advise anyone that has gone through a tragedy like we did, to contact Michigan Fire Claims and get what’s due you. Dear Michigan Fire Claims, Inc. Words cannot justify how grateful my family and I are for the services you have provided for us! We were not prepared for losing everything to a fire, or everything that follows after the devastation of a fire. From the moment you were referred to us, a weight was lifted! Not only did you handle everything with my insurance company, you fought and got us enough funds to be more than comfortable while our home was being rebuilt. You kept us informed of everything step-by-step. Our house was a total loss. The contractors you recommended to rebuild our home were also wonderful to work with. Not even six months and we were able to move back home! Thank you so much for making something so heartbreaking and traumatic a lot easier on our family to go through. If you ever have a major home owners/renters insurance claim call these guys the immediately after you hang up from reporting your claim! They work hard and fast to get you the best claim settlement. I loved my insurance company and never had an issue… until my first major claim. It was a nightmare that dragged on and on. I was lucky enough to have a casual acquaintance refer me to Tom at MI Fire Claims. Tom, Dom, and Gary are great guys who I felt really cared about helping me get a fair settlement from the insurance company. They were able to double the settlement my insurance company initially offered me, well worth the 10% fee they collect from the total award. Can’t say enough good things about them. It has been five years now since I needed your service. I lost my home in March of 2010 to a house fire. I was getting the run around from my insurance company when I called and met with Nik the very next day. Thanks to him and the great team he has working for him I was able to buy a new home and recover what I had coming from the insurance company for my contents and home. If you should ever need references I would be happy to meet and speak with anyone. Looking back, we are absolutely convinced we would not have had the same positive results had you not been there to guide and support us, and more importantly to be our advocate when things got tough (which was often). In particular, we would like to recognize and thank Ross and Kelly for allowing us to send many emails and texts, for taking our phone calls to help answer our seemingly never ending questions, and for guiding us in the best way possible – both are absolute professionals in every sense of the word. We can’t thank you enough for giving us your time, expertise and a well-timed hug or joke when we needed it most. A little over two years later, we are back in our home – at peace and happy. Our claim is over and our life is back to normal. Our rebuilt house looks beautiful too. All of this would not be possible had Michigan Fire Claims not been there to ensure we were being treated properly by our insurance company and by our contractors. When we think of the things we appreciate, we think of your company and employees work on the catastrophic loss of our home due to a fire. The experience was a challenge, but with your company’s assistance, it became a positive learning experience for us. We are most grateful for your compassion, vast knowledge, and determination to ensure we receive a fair insurance settlement. Your company and employees worked very hard to ensure we reached a common satisfactory goal. For these reasons, you have our most deepest respect. Thank you for all of your support during a very difficult time in my life. As you know, it was not an easy decision for me to make, however it ended up being a very good decision and one that helped me a great deal during a very emotionally difficult time. I am deeply appreciative of everything you and your fine staff did to help me and I will remember that for the rest of my life. Michigan Fire Claims did everything they said they would. I would be happy to use their services if I ever needed again. We were devastated and didn’t know what to do. The insurance company was not explaining any of our rights. We hired Michigan Fire Claims and they explained everything to us. We were able to take the money and not rebuild. Michigan Fire Claims was able to get me the maximum limit on my claim. I found a friend in Nik at Michigan Fire Claims and will never hesitate in referring them. Michigan Fire Claims gave us substantially more than the insurance company wanted to pay us. We were lucky to have them on our side. I was extremely pleased with the communication between MFC and me. They were able to give me weekly updates on the status of my claim. I used Michigan Fire Claims 10 years ago on my house fire and was unfortunate to have another one this year. I did not hesitate to call them to the rescue again. 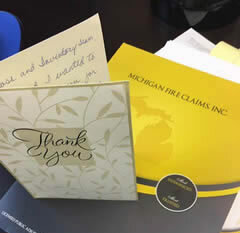 We were referred to Michigan Fire Claims and will always be thankful for their help in our house fire. A tremendous weight was lifted off our shoulder knowing we had you preparing and presenting our loss to State Farm. We were able to continue our normal work schedules without all the added pressure. Thank You. We wish to thank you for handling our flood with professionalism and care to our home and belongings. Michigan Fire Claims, Inc was able to get us double the offer from the insurance company. Thank you! Michigan Fire Claims, Inc was able to do everything they assured me could be done on the loss. We were able to take the settlement, pay off the home and purchase a beautiful home not far from work. Thank you for the work performed on our fire claim. We are happy with the settlement. We will continue to refer you to friends, relatives, and any one we meet with a fire loss. If you’re one of our previous or existing clients, we value your feedback. Please add your testimonial in the form on the right side of this page. Thank you!